Appendix B. Configuring electrical linking of dual control stations. Appendix C. Configuring helicopter cyclic control loading mode. IMPORTANT - The previous version of the On-Line User Guide (for older CL_SPU & BLDRV2 cards) is here. 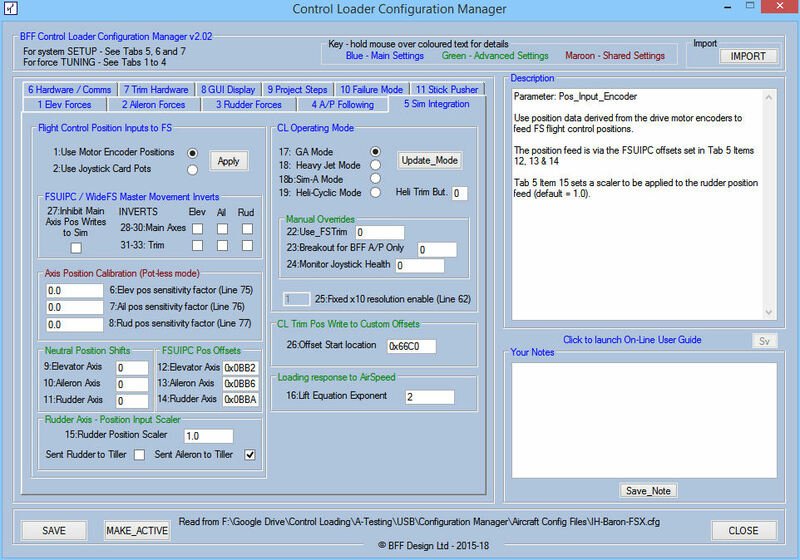 IMPORTANT - The BFF Control Loader software operates with BLDRV brushless motor driver cards in properly designed and built simulator flight control systems. Before using the software please ensure that your BLDRV3 drive system has been properly set up and commissioned, and has been tested using the BFF Driver Test application in accordance with the project instructions. For details of the project documentation see here, and for details of the BLDRV3 cards see here. The BFF Control Loader software runs with MS FS9/X (also Lockheed Martin� Prepar3D�) and X-Plane v11+. There are separate versions of the CL software for MSFS and X-Plane; both versions are included in the download zip archive. 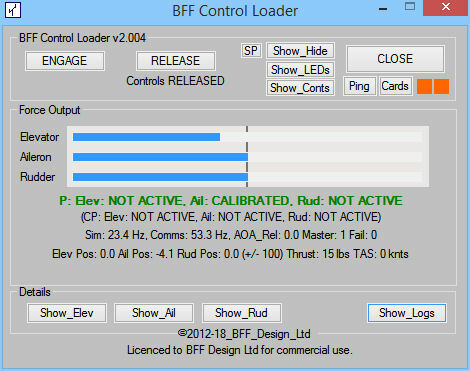 The BFF Control Loader V2+ software consists of two main applications. BFF Control Loader is the control loading driver software. 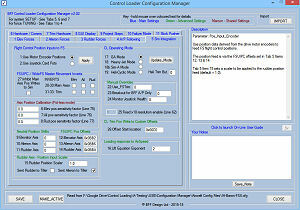 The Configuration Manager is used for system setup. A third application, Driver Test App USB is also included for initial system setup and testing. Installation is simply by unpacking the contents of the Zip package into a dedicated folder on your PC. The software does not write any values to registry, so to delete the software just delete the installation folder. Run the programs from this folder, or create shortcuts which point to the folder - DO NOT remove the files from the folder to run them. DO NOT mix the files from new and old installs - always unzip the new software into a new folder. If you are upgrading from a pre V2 version then do not mix the configuration files of the new and old versions. Unzip the new version into its own folder. Then run the Configuration Manager in the new installation and use the IMPORT button to import the settings from your previous installation. To use with X-Plane, XPUIPC v1.9.0 or later needs to be installed and the customised XPUIPC_offsets.cfg file in the zip package should be copied to the correct X-Plane XPUIPC folder. Follow the instructions in the XPUIPC documentation. See also section 6 for other important information. See http://www.tosi-online.de/XPUIPC/Home.html. Copyright � 2011-18 BFF Design Ltd All Rights Reserved.